As a man down alert, most users are Law Enforcement Agencies, undercover officers, and VIPs. Police use the system as a surveillance body wire to listen to their inside man. If trouble happens, their operative can either signal for quick support using the duress call, or turn on the tracking beacon, activating the functional tracking transmitter. Basically anyone working under life-threatening conditions would want a man down transmitter. Man down alert functions are used not just undercover users but executives who have body guards and need to summon them for help. How do man down transmitters work? By activating its duress call, a discreet, silent alarm is generated to alert a commanding officer, security team, rescue squad, or medical team that the user has encountered a problem and needs assistance. As a surveillance body wire, they can listen to the user while they attempt a rescue or before they breach the room. 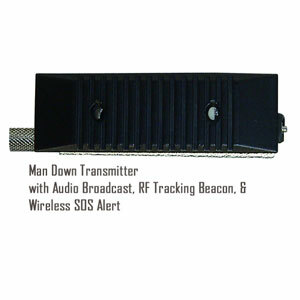 In extreme situations, they can use the tracking transmitter feature and determine the general location of the user using a field intensity directive receiver. The Man Down feature coupled with the dual-mode audio tracking function makes the G1400MD a guardian angel.